The new portable nets are here and the new courts have been reconfigured and painted. 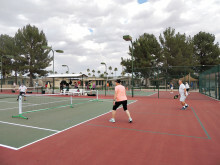 Come out and enjoy the fun on Tuesday, Thursday and Friday from 2:00-5:30 p.m. and on Sundays from 3:00-5:00 p.m.
Margaret McCathern Have fun with Pickleball October through April at the SunBird tennis courts. We play on Tuesday, Thursday and Friday at 2:00 p.m.; Sunday drop-in at 3:00 p.m. Equipment is provided. Please wear tennis shoes. See you on the courts! For any questions call Margaret at 480-883-8753. 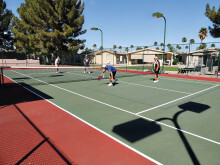 Calling all Pickleball players! 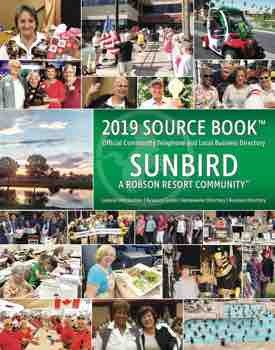 Scheduled play will begin again in October on the following days and times: Tuesday, Thursday and Friday at 2:00 p.m.; Sundays at 3:00 p.m. For any questions call Margaret McCathern at 480-883-8753. Welcome back! 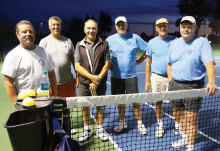 We play on Tuesday, Thursday and Friday beginning at 2:00 p.m. For Sunday afternoon play see court board for times. New players are always welcome. If you have any questions contact Margaret McCathern at 480-883-8753. Please leave your name and contact number or you can just show up at the courts! Have fun!